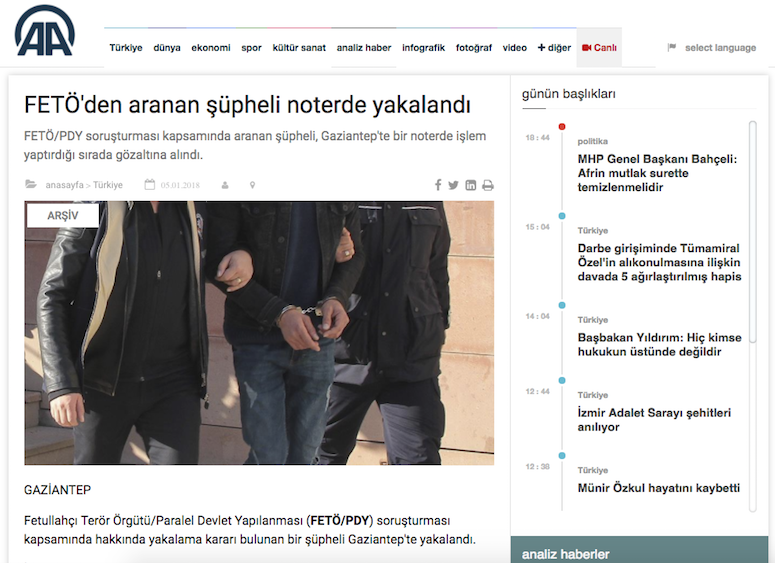 A Gaziantep man, identified as Ali Ö., was rounded up by police who carried out operation to a notary’s office as part of an investigation into the Gulen movement. State-run Anadolu news agency reported Jan 5 that Ali Ö, sought over Gülen links in a Van-based probe, was detained while he was visiting a notary’s office in Gaziantep’s Şehitkamil district to deal with personal transactions. Anadolu said the suspect is set to be transferred to Van where he is expected to stand trial over alleged ties to the movement. The government blames the movement for the July 15, 2016 failed coup while the latter denies involvement. Nearly 150,000 people have lost their jobs as part of the government’s post-coup crackdown while some 140,000 were detained and 60,000 were remanded in prison since the summer of 2016. Police seek many others who try to avoid what many think government’s unfair post-coup trial. Meanwhile, hospitals, hotels as well as state institutions have become common places where suspects are required to check in for registration, involuntarily helping law enforcement to locate them. On many occasions, police detained female suspects at hospitals immediately after they checked in to give birth to their babies.